Olympic Unity House will be the new headquarters of the International Olympic Committee. Image courtesy of International Olympic Committee, ©3XN. The headquarters have been designed based on three key principles, which are movement, flexibility and sustainability. Image courtesy of International Olympic Committee, ©3XN. Imbibing the Olympic concept of unity, the new headquarters will include a central staircase designed after the Olympic rings. Image courtesy of International Olympic Committee, ©3XN. The open design promotes interaction, communication and knowledge sharing. Image courtesy of International Olympic Committee, ©3XN. The new headquarters have been designed to establish an iconic structure that celebrates IOC’s 100 years in Lausanne. Image courtesy of International Olympic Committee, ©3XN. The Louis-Bourget Park at Vidy will be accessible to both the IOC staff and general public. Image courtesy of International Olympic Committee, ©3XN. Olympic Unity House, the new headquarters of the International Olympic Committee, has been designed by 3XN Architects and is under construction in Lausanne, Switzerland. The building is being constructed in collaboration with local architects IttenBrechbühl. 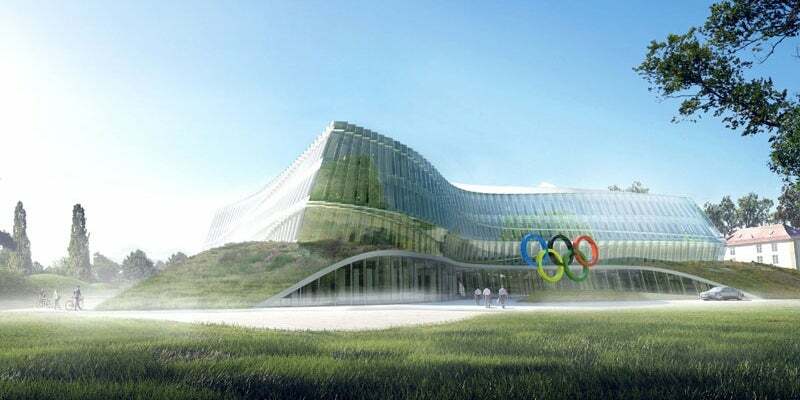 The headquarters will be located within a park on the banks of Lake Geneva close to Château de Vidy, the iconic home of International Olympic Committee (IOC). "The architects were selected through a multi-stage, international competition that was launched in 2013 and concluded in 2014." The architects were selected through a multi-stage, international competition that was launched in 2013 and concluded in 2014. The competition received entries form 118 architecture practices that were narrowed down to three entries before selecting the winning entry, the Olympic Unity House. A special ceremony was held on 8 December 2015 at Vidy to mark the stone laying ceremony for the new headquarters. IOC is investing Sfr200m ($200.9m) to bring together 600 employees working in different locations under one roof at the Olympic Unity House. Reflecting Olympism, the Olympic movement and the collaborative role of IOC, the design of the building is centred on the Olympic symbols of integration, movement and dynamism, peace and unity. It has been designed to establish an iconic structure that celebrates IOC’s 100 years in Lausanne. Spread over 24,000m², the headquarters have been designed based on three key principles, namely movement, flexibility and sustainability. The building design resembles rectilinear boxes with their centres pushed in. The shape imitates the movements and dynamics of an athlete in-motion. The design unites and welcomes all the IOC members and provides a meeting place for the Olympic movement. Different features have been included in the design to ensure that the building blends into its environmental and historic setting and merges with the local population. The green plinth of the Unity House has been designed to match and blend with its surrounding greenery and will feature hospitality functions. Imbibing the Olympic concept of unity, the new headquarters will include a central staircase, designed after the Olympic rings, to connect the different levels within the building. The Olympic Unity House is designed to convey the energy of an athlete in-motion through its dynamic and undulating façade, which presents a different view from different angles. Interior of the building reflects open and flexible environment that has been achieved by creating very few structural constraints. The open design promotes interaction, communication and knowledge sharing while encouraging easy adaptability to multiple work styles. The headquarters will have three work levels that will house office spaces. A central area for social activity will be created at the unity staircase and its immediate surroundings that will also encourage a sense of community. A number of private, semi-private and social zones will be designed in the building along with five large meeting rooms and other core areas required for efficient functioning of the organisation. The complex will include an open space serving as a welcome zone, a sports centre, a restaurant and a sports café where visitors can watch events. To cultivate a sense of transparency and openness, the Louis-Bourget Park at Vidy will be accessible to both the IOC staff and general public. Sustainable features such as energy-efficient systems that include lake water pumping, photovoltaic panels and daylight optimisation will be incorporated in the building’s design. Photovoltaic panels on the roof of the unity house will display an important Olympic tenet of peace by featuring panels shaped similar to a dove landing in the park. ertex solar provides photovoltaic solutions for renewable buildings. The company's solar panels produce electric energy that can be integrated into facades, skylights, balcony rails and conservatories.